Believe it or not, no one wants to see the real thing in a theatre. Reality is mundane. A facsimile, the imitation of life, is required to make boring reality all the more accessible — real-seeming — to a viewer. The dream of the right way to approach a thing, of just how to say the essence of the matter — that is what we crave to see on a stage, and Single Carrot Theatre, one of Baltimore’s consistently most daring companies, offers Church. Sarah Gavitt, Aldo Pantoja, Melissa Wimbish, and Richard Goldberg. Photo by Chris Hartlove. This postmodern ceremonial spectacle of a play is not high octane poetic sensation and mesmerism, like some other rather daring productions Single Carrot has offered. Linus and Alora this past summer was madder, moved more, and spoke directly to the senses. Crave three years back was as still as can be, but shook one’s core with its overflowing emotion. The show this time is a facsimile of church, with four reverends, several sermons, confessions, spiritual music, discussions of theology and religion, and cathartic dancing. What’s powerful here is the resemblance of the form — this is so like ‘church’, but it’s definitely theatre. Right from the top, there is a running disparity between the two experiences that both challenges the show and causes the audience to think. However, this thinking is not likely in wonderment and awe so much as in bemusement. The pulpit is raised above the ordered columns of seats. The ceremony goes. A well-dressed reverend with a calm demeanor, a broad smile, and a smooth delivery welcomes everyone to this event. Sermons are delivered and thoughts on faith are offered, but the growing of grace in the soul does not seem to be the point as much as in a real church. 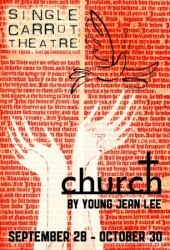 In fact, this production of Young Jean Lee’s difficult postmodern play is a play on forms, blurring ‘church’ and ‘theatre’ from the first notes of sacred harp music played to the handshakes with the reverends on the way out after the service/show, with the biggest point made being a celebration of both forms, while simultaneously ripping to shreds the standard text and messages of church. The speeches are hilariously bizarre at times, pointing to both the ridiculousness of church and the hypocrisy that is rampant within it. Confessions run rampant. Faith itself is exalted, but there is not an approach to God other than a kind of necessity of faith that seems a given to these reverends. Jesus is compared to a goat that will eat warm sand out of your hand. The need for faith during hard times is often referred to, and the clear enjoyment of the rituals employed, but these reverends never fail to at once seem both real and ridiculous. A projected stained glass window behind the pulpit morphs with the direction of the sermons. The levity is there. This is not a solid environment, it is subject to play. And fortunately the performers are all very strong, keeping faith intact, their eyes wide with zealous glints. 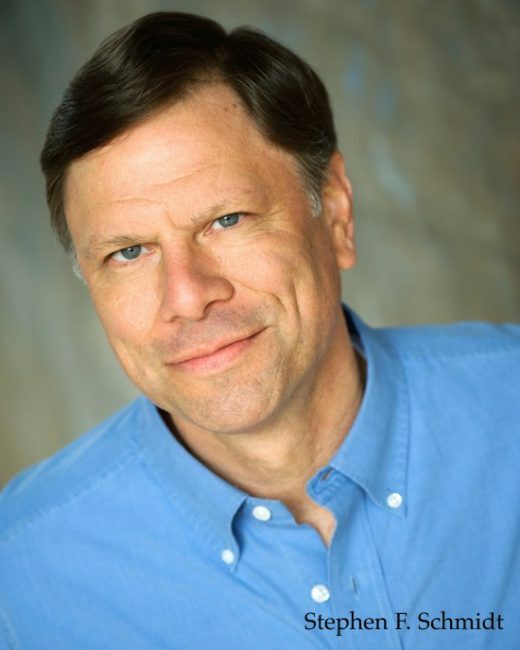 One reverend, Aditha (Richard Goldberg), has broken up with his gay lover and has done many illicit drugs, but rails against the “masturbation rage” that might be found in church. The lead reverend, Reverend Jose (Aldo Pantoja, Single Carrot’s Director of Audience Development), presents strange parables, describing all of his audience as mummies, wrapped in our swaddling clothes of infancy still, protected but bloodthirsty. “You are messed up,” he says. Meanwhile, Aditha says “sin has nothing to do with being messed up”. Another reverend, the down home country woman, Sarah Jane (Sarah Gavitt), makes very personal prayers for herself in front of the audience, while the other, Bo (Melissa Wimbish), shows a massive identity confusion in her description of a dream. A “gushing tower of chicken blood” is brought up. Religious imagery lampooned, but this is also somewhat serious. 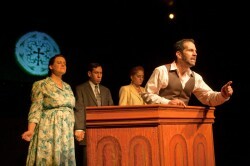 The play never lets go of the point that church is implicitly good, that practicing and loving faith is rewarding. The text is not quite maddening, though. If John Lennon can make a cool beauty from nonsense with “I Am the Walrus,” then these devout mad people can still build a tower of faith from their nutty rhetoric. And before long, rather wackily inspiring music and movement take over. One magnificent musical moment occurs, a post-rock song called “Bread,” by a mid-00s New York group called On!Air!Library!, is beautifully harmonized a capella by three of the reverends, featuring the apt lyrics, “shaking in your bones is required to dream up large colossal empires.” The piece is strange, with odd choreography, awkwardly leaning into the absurd, but maintaining a twisted beauty. When the choir suddenly emerges near the end of the evening, the size of it and the oddity of this secret gang of the devoted feels like a cheat. Where were these people until now? Why were they not amongst us the whole time? Who are they? Britt Olsen-Ecker leads out a group that praises the Lord and suggests we get drunk in the valley of the shadow of death. It is exciting and reaches toward a wished for catharsis, but the distance is huge by this point between the audience and the church. It feels as false as theatre is. Once upon a time, I worked as an actor at a silly murder mystery dinner theatre. Audiences participated in the still very scripted narrative, asking questions, directing the often improvising actors to offer needed clues as to the who-done-it?’s soultion. The show was different every time, and often, greatly improved by the better, more attentive, more interactive audience. With the added element of the cash bar and the influence of alcohol, this made for some interesting variables. In character, more than once, I danced around the tables with an audience member, a potential murder suspect leading a wondering patron down my merry way. Who knows what may come? Here, the thrill is in the blurred lines between the perceived sacred and the prescribed performativity. Fortunately, Single Carrot offers a complimentary glass of wine at the door. Usually it is frowned upon to speak in the theatre, unless asked for, but the same goes in church. 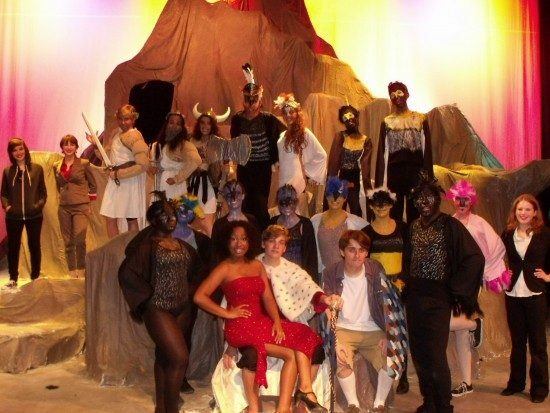 But this production quirkily offers complete participation. Comment on a theatrical production that involves the possibility of audience interaction and, potentially, full-blown participation in the creation of the experience itself of the play is daunting. Anything might happen one night that will be very different from what the next audience might encounter the next. The audience brings a sizable portion of the play. This is not to say that Church does not function without much audience interaction. A passive audience will still have a show. However, the most thrilling experience here will likely be the one with the least detached, most engaged audience. Play along, participate, open yourself to this show, and it will give back. This may be the most disappointing or most exhilarating of shows. I speak now from personal experience, because my unique audience will have been different from any other. Who comes to Single Carrot’s long, dark sanctuary/theatre space are mostly highly educated aesthetes, working people with minds for the arts, who appreciate the strange sermons and the wild, clashing dynamics of the blending of forms here. My audience was quiet. We offered one prayer up. We barely clapped along with the choir. When someone “amen”-ed, it was laughed at, and after, the person was asked if he was in on it. Would that this audience could be a proportional mix of the artistic and poor urban community that does live in Station North. This is an exhilarating experience when it is about the audience/show dynamic, when the show is just about listening to strange rhetoric and considering religion, Young Jean Lee offers only more playful post-modern ambiguity. Watch a sneak preview of Church.